Glaucoma refers to a family of diseases that damage the optic nerve and is one of the leading causes of blindness in Canada. It is a progressive disease that most frequently occurs in individuals over the age of 40, with the risk of the disease increasing with age. There is also a greater risk of developing glaucoma for people with diabetes, high blood pressure, a history of eye injuries or a family history of glaucoma. Elevated pressure within the eye damages the optic nerve, which can lead to serious vision loss if not detected and treated early. The optic nerve is the nerve that takes all of the information from the eye and transmits that information to the brain. In open angle glaucoma, the most common form of glaucoma, there are usually no symptoms until the individual experiences peripheral vision loss, which is why glaucoma is referred to as "the silent thief." In a more rare form of the disease, called closed angle glaucoma, there is a sudden rise in the pressure within the eye, and the individual may experience pain, blurred vision and see halos around lights. Untreated, both forms can lead to complete loss of vision. As there is no way to prevent glaucoma, a comprehensive eye examination with your Doctor of Optometry is the only way to detect glaucoma early enough to prevent vision loss. Your Doctor of Optometry will perform a simple and painless procedure during your routine eye exam, which measures the internal pressure of your eye. 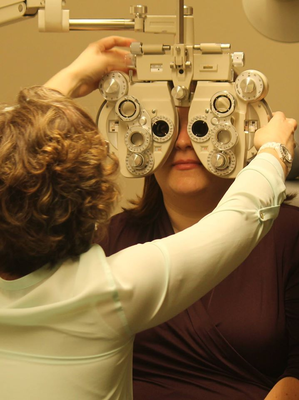 Your Doctor will also look into your eye to observe the health of the optic nerve and measure your field of vision, and determine if there is a need for additional imaging. If detected and treated early, eye drops and laser surgery are usually effective at maintaining your vision, and little or no further vision loss should occur. If left untreated, peripheral vision is affected first, followed by central vision loss during late stages of the disease. Complete blindness may occur. Special equipment may be used to image your eye to better monitor the progression of glaucoma. Age-related macular degeneration (AMD) affects the macula - the central most part of the retina, which is the inner layer at the back of the eye responsible for detailed central vision. The macula is used for reading, driving, and recognizing people's faces. Macular degeneration causes the center of your vision to blur or distort while the side of peripheral vision remains unaffected. It is generally related to the aging process, and is the leading cause of blindness in North America in adults over the age of 55. While there is no cure, early detection and preventative measures can delay or reduce vision loss. There are two types of AMD: dry and wet, with the dry form being more common. It is also the milder form, where there is a gradual degeneration of the central retinal tissues that make up the macula and symptoms generally develop slowly over time. The wet form is a sudden leakage, or bleeding, from weak blood vessels under the macula and symptoms progress rapidly. Wet AMD accounts for approximately 10 percent of all cases, but the dry form can develop into the wet form over time. In the earliest stages, macular degeneration is entirely symptom free but can be detected during routine eye examinations by your Doctor of Optometry. The most common initial symptom is slightly wavy or distorted central vision when performing tasks that require seeing detail. This blurred spot, or sense there is dirt in the way of clear vision, cannot be corrected with eyewear. Over time, the damaged area may increase in size and interfere with reading and recognizing faces. Patients don't experience any pain with AMD. Early detection is crucial as there is currently no cure for AMD. Dry AMD is treated with lifestyle modifications like exercise, wearing sunglasses to reduce UV radiation and stopping smoking. Many cases of wet AMD can be treated with injections of anti-VEGF therapy into the eye to stop leaking blood vessels. Ocular vitamin supplements including lutein, zeaxanthin, and vitamins C, E and Zink, can also assist in slowing the progression of AMD. Lifelong UV protection and good nutrition are believed to play key roles in preventing AMD. Living a health lifestyle by keeping your blood pressure down, reduction your intake of fatty foods and not smoking are all recommended. A diet high in antioxidants, such as those found in fruits and leafy vegetables, may help prevent AMD. Regular eye examinations by your Doctor of Optometry are also important in the early detection of AMD. For more information, please contact our office at 250-390-1447.